You are currently browsing the category archive for the ‘Travel’ category. Rigs loaded and ready to roll at the Hotel Pullman, Varadero. 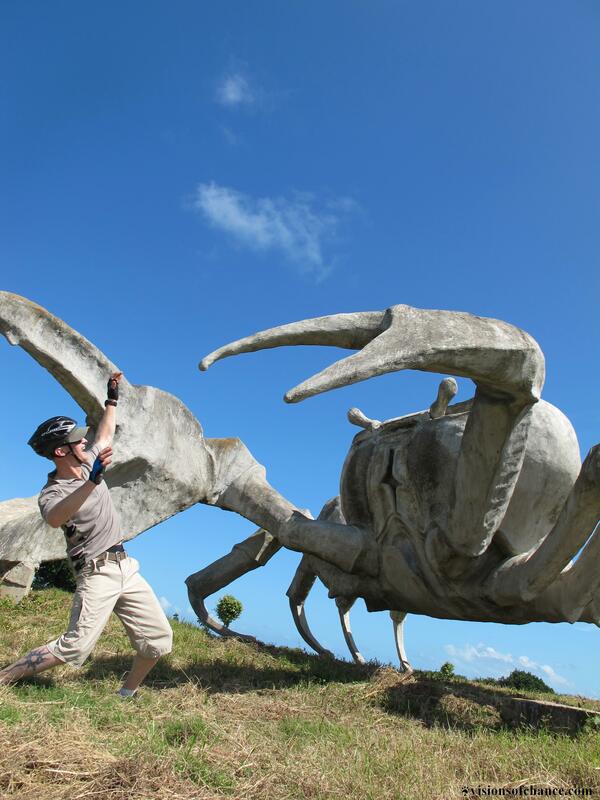 Eager to get out of the tourist zone, we hit the road in the a.m., and after an hour of cycling we were attacked by giant crabs! That’s when we realized we must be lost….first wrong turn less than a kilometer from the hotel. Back on track, the afternoon passed with copious sweating and much rubbernecking at the new scenery. It felt great to be on the road after all the planning, anticipation and air travel. We stuck with our plan of a relaxed schedule by going with the flow and camping on a nice beach just east of Matanzas, enjoying another fine meal with ocean views, and plenty of rum with our new friends Alexander and Jasmany. On the road near Jibacoa, east of Havana. 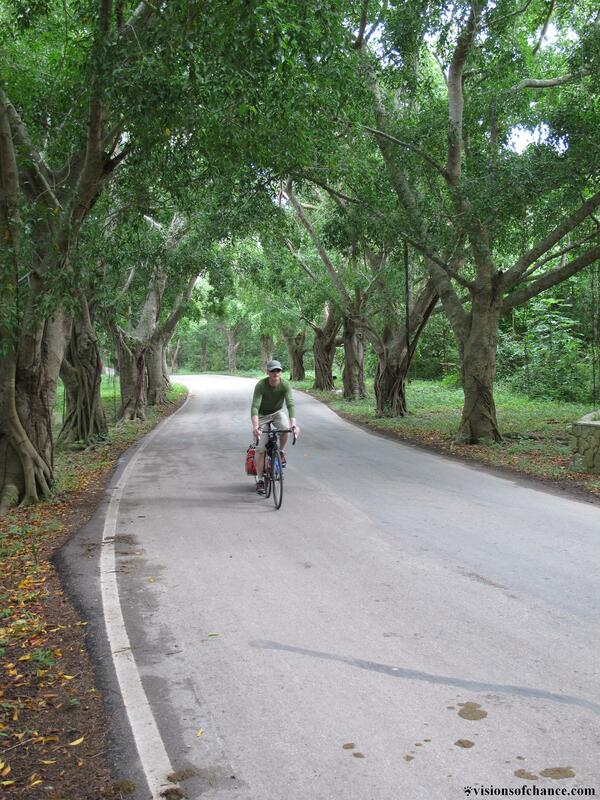 After cycling through Matanzas the following morning, we continued along through the countryside on both tranquil back roads and busy multi-lane highways, heading in the direction of Playa Jibacoa. Rolling hills green with jungle, palm trees, glimpses of the ocean, cows, goats, chickens, horsecarts and friendly/curious Cubans kept us entertained until we pulled into Campismo los Cocos, the Cuban version of a campground. Which doesn’t involve camping at all, but renting one of many small concrete bungalows in a fenced in fully serviced compound. Restaurants, games rooms, medical center, swimming pool and a bar (equipped with a stereo that cranked out very loud Reggaeton to the wee hours..). The journey west the next day brought us to Guanabo, a some-what rundown town in the Playas del Estes area, a popular spot for Habana habitants to escape to the beach. With no need to rush into the city, we decided on two nights here, in the Casa Particular (like a B&B, plus dinner) of a very nice lady named Mercedes. The day off at the beach was good for the muscles tender from the cycling, but we both got a little crispy from the sun. A short ride on the increasingly busy road into Habana the next morning, then our trusty guidebook had us winding through narrow roads flanked by farms and banana plantations in search of the ferry to take us across the Bahia de la Habana into the old city. Nods and shouts of “Si! Si!” to our simply question of “La Lancha?” ( “The Ferry?” accompanied by a finger, pointing in the direction we hoped was correct) eventually put us in the right spot, and we jumped on the boat, bikes and all. 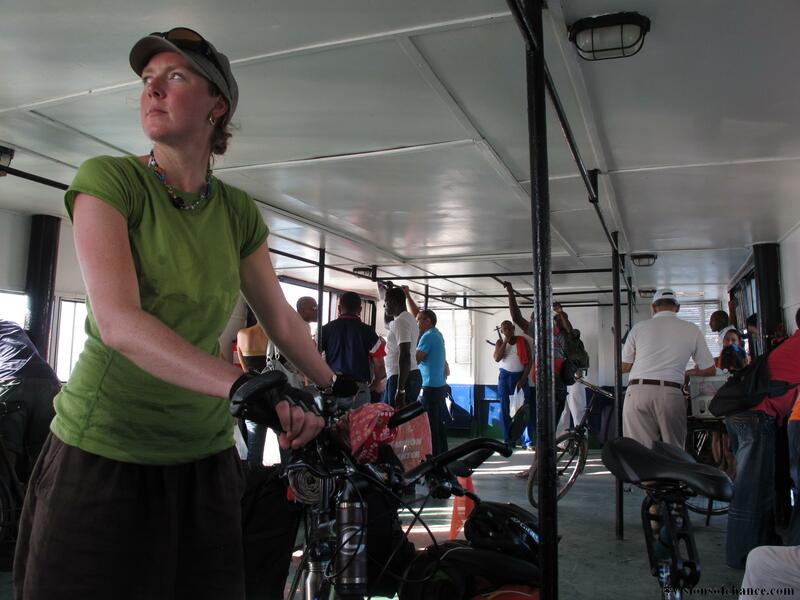 On board la lancha (ferry), heading across the bay to historic Habana. 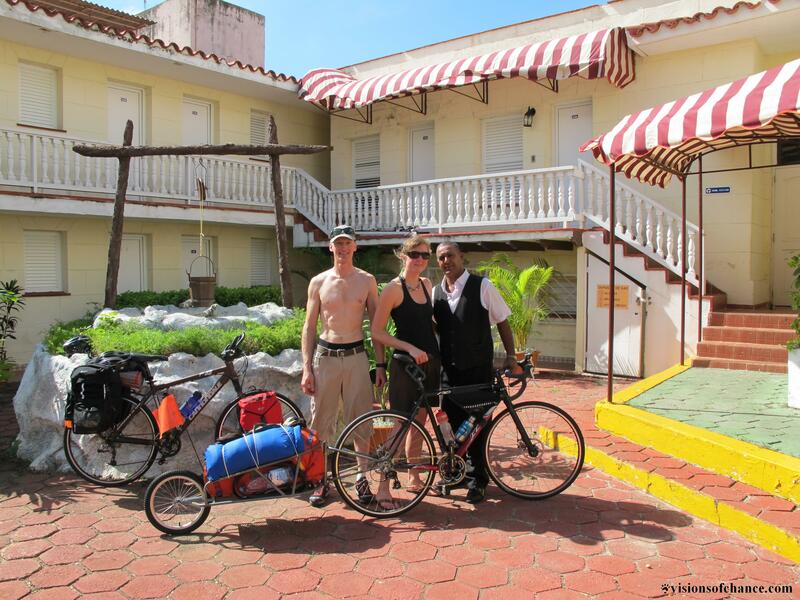 Rather than negotiate the heart of Habana on our loaded bikes, we opted for hiring a taxi. We packed our gear into the mini-van and took in the sites as our driver navigated through the city. We had a casa in mind from one of the guide books, but we had been unable to figure out the public phones to make a reservation. Two strokes of luck: the driver knew where the casa was, and we happened to catch Victor, the husband of the lady in charge of the place, on his way out the door. He set us up in the gorgeous garden in the back of the house with cold drinks of rum and fruit juice, and we awaited her arrival in comfort. This is where we would stay for stage 2 of our adventure…. © Aaron Chance and visionsofchance, 2012. Unauthorized use and/or duplication of this material without express and written permission from this blog’s author and/or owner is strictly prohibited. Excerpts and links may be used, provided that full and clear credit is given to Aaron Chance and visionsofchance with appropriate and specific direction to the original content.